A friend from church had a little baby boy about a week and a half ago, so I wanted to make her a card to go with the small gift we got for her. 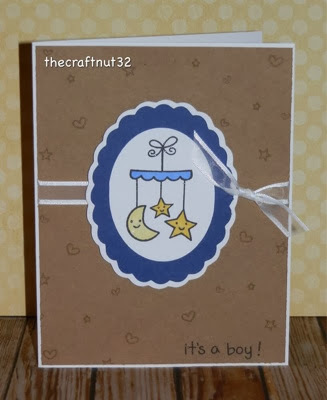 I am so happy with how his card turned out :) I used the Lawn Fawn, Plus One stamp set for the cute mobile and sentiment, and the Elegant Edges Cricut cartridge to cut out the scalloped oval and frame. I coloured in the stars and moon with my Spectrum Noir markers and then added some Wink of Stella glitter to them. I stamped some little stars and hearts on the craft card stock with some Versa Mark ink.